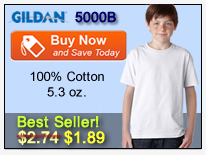 We make it easy to buy t-shirts in bulk. We do not not require any kind of tax I.D. or other paperwork. Sales Tax is only added to your order if you are ordering tee shirts within the state of Utah. If you are in Utah and are tax exempt, please email us to make arrangements. 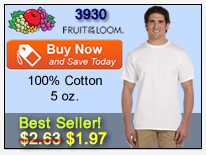 Within any specific style number, the price per tee shirt goes down when you reach bulk quantities of 12, 36 and 72. 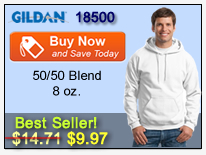 Your total amount of bulk t-shirts can include any mix of colors and sizes. So, for example, if you wanted to get the best price per shirt of a certain style, you would arrange it so the shopping cart contains 72 or more of that style. This could be 18 Small, 18 Medium, 18 Large and 18 XL (or any other combination of sizes) and whatever variety of colors you need. 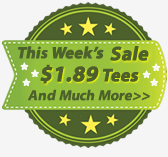 As you add tee shirts in bulk to the shopping cart, the price per tee shirt will automatically adjust to reflect our bulk t-shirt pricing when your total reaches 12, 36 or 72. So, don't worry when you first add a few shirts to the cart and the price per shirt is not reflecting the quantity discount. It will adjust for you when the totals are met. 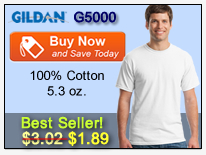 In most cases, the bulk tee shirt base price displayed is for white t-shirts while colors are more. The drop down menu that you use to make your color selection will display the additional price for other colors. This is also the case for sizes 2XL and up. You will see the additional price in the size drop down menus.